Thursday 31st December 2015 – 7.15am – Chris Kowalik. The driver of this car (pictured) had only a minor injury. West Midlands Ambulance Service was called to Field Road, Blowxich shortly before 2.35am today. Thursday 31st December 2015 – 7am – Chris Kowalik. 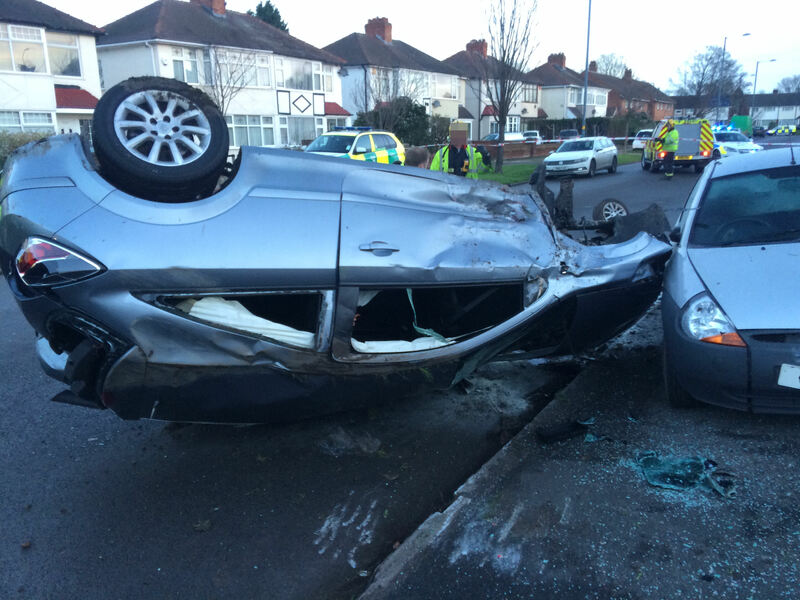 Three people have been injured after the car they were in overturned in Dudley. 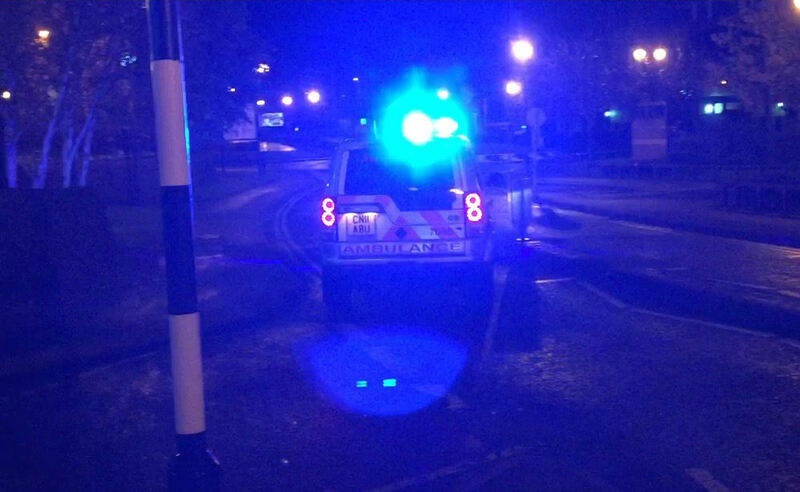 West Midlands Ambulance Service was called to Birmingham New Road at 1.35am today. Three ambulance crews, a paramedic area support officer and the Medical Emergency Response Incident Team (MERIT) made up of a trauma doctor and critical care practitioner attended. A West Midlands Ambulance Service spokesman said: “All three occupants are believed to be in their twenties. “A man who was the driver and a woman who was one of his passengers had both managed to get themselves out of the car and had numerous injuries. “A second woman who was the other passenger in the car was initially trapped and cut free by the fire service. She had a leg injury. Tuesday 29th December 2015 – 10.00am – Claire Brown. 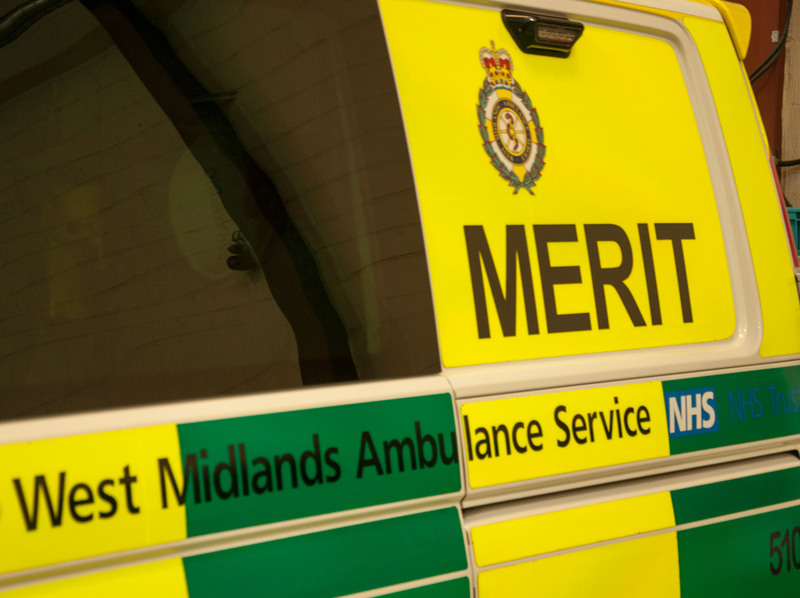 A woman received vital trauma care from ambulance staff following a collision with a car in Birmingham earlier this morning. 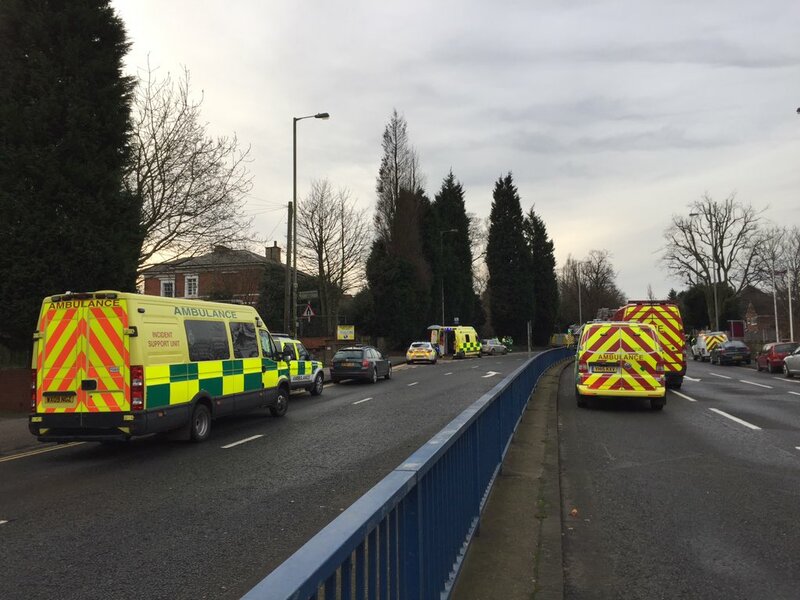 West Midlands Ambulance Service was called to reports of a collision involving a car and a pedestrian near to the junction of Gospel Lane and Olton Boulevard East in Acocks Green at 7.15am (Tuesday). A passing ambulance stopped to render aid whilst a second ambulance, a paramedic area support officer and a senior critical care paramedic attended the scene. A West Midlands Ambulance Service spokeswoman said: “The pedestrian, a woman, was unconscious and had suffered multiple serious injuries. The team of ambulance staff administered advanced trauma care on scene before she was taken by land ambulance on blue lights to nearby Heartlands Hospital. “Upon arrival, the Trust’s MERIT trauma doctor met up with the ambulance crew and jumped on board to continue emergency treatment during the onward blue light transfer to Queen Elizabeth Hospital Birmingham, a major trauma centre. Monday 28th December 2015 – 8.15pm – Murray MacGregor. A motorcyclist has died after a collision with two cars. 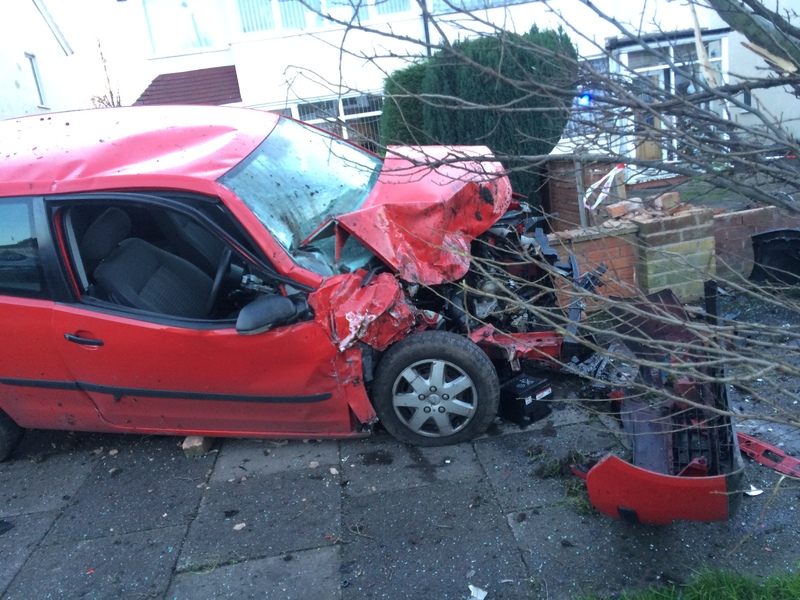 The crash happened at about 5.00pm on Oldbury Road in Rowley Regis. A paramedic, the CARE Team, an ambulance and a paramedic officer were sent to the scene. A West Midlands Ambulance Service spokesman said: “A paramedic and the CARE Team, which includes a pre-hospital doctor, arrived on scene in under six minutes of the call. “They found the rider was in cardiac arrest and immediately started resuscitation. “They carried out advanced life support but sadly, despite their best efforts, it was not possible to save him and he was confirmed dead at the scene. Monday 28th December 2015 – 5.55pm – Murray MacGregor. Ambulance bosses are urging drivers to take care when they approach large puddles after an elderly lady was left hanging upside down from her seatbelt after her car overturned after it aquaplaned. The incident happened on the B4348 between Vowchurch and Peterchurch in Herefordshire at around 10.45am on Monday. An ambulance, a paramedic area support officer and the Midlands Air Ambulance from Strensham attended the scene. 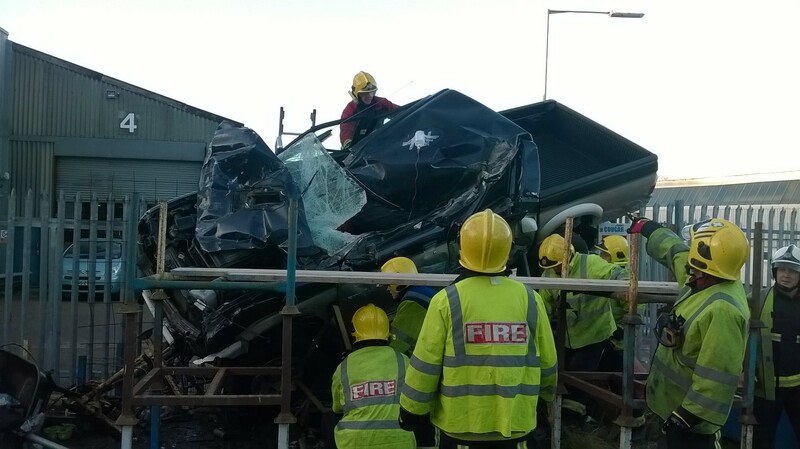 A West Midlands Ambulance Service spokesman said: “On arrival, crews found a car upside down. The 83 year old lady driving was helped out of the vehicle. “She had suffered some back discomfort and a cut toe, but was otherwise just shaken up by what had happened. “After being assessed at the scene, she was taken to Hereford County Hospital as a precaution by land ambualnce, but her injuries were not serious. Monday 28th December 2015 – 5.46pm – Murray MacGregor. A man has died after he was in collision with a car on a busy dual carriageway. The collision happened on the southbound A38 at the junction of the A5121 at Branston near Burton-on-Trent at around 1:40pm on Monday afternoon. Monday 28th December 2015 – 4.40pm – Murray MacGregor. 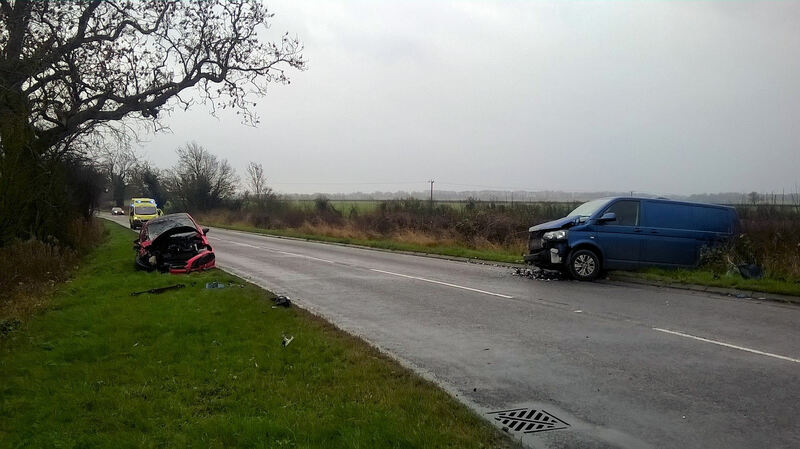 The drivers of two high powered cars have been ‘more than lucky’ after escaping serious injury despite a collision that left one car in a hedge and the other with substantial front end damage. The crash at the junction of the A449 and Doctors Lane in Kingswinford happened at about 2.50pm on Monday afternoon. An ambulance and a paramedic area support officer were sent to the scene after a number of calls about the collision. 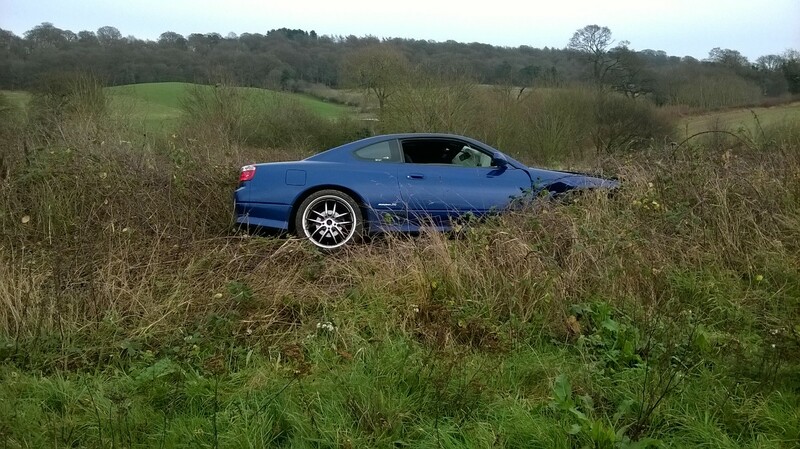 A West Midlands Ambulance Service spokesman said: “On arrival, crews found a BMW in a hedge surrounded by brambles. 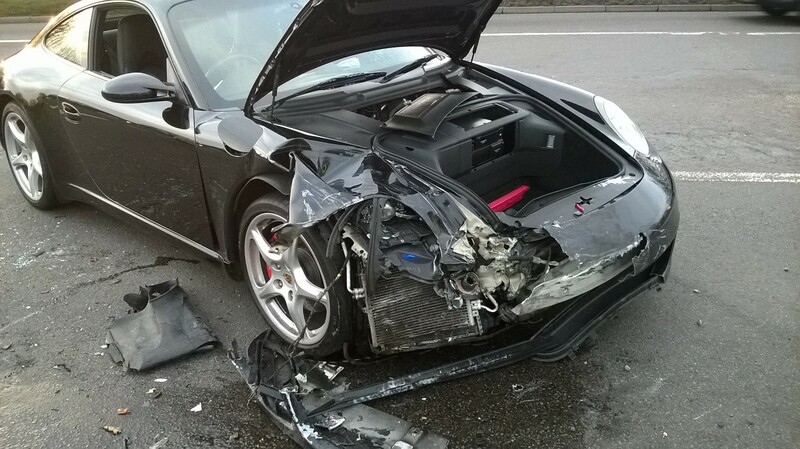 A Porsche 911 was in the middle of the southbound carriageway with front driver’s side damage. “Thankfully, both men had managed to get out of their respective cars. “The 29 year old BMW driver was shaken but otherwise unhurt. The 35 year old Porsche driver had a burn to his right forearm but said he didn’t want to go to hospital to have it assessed further. Monday 28th December 2015 – 11.05am – Murray MacGregor. 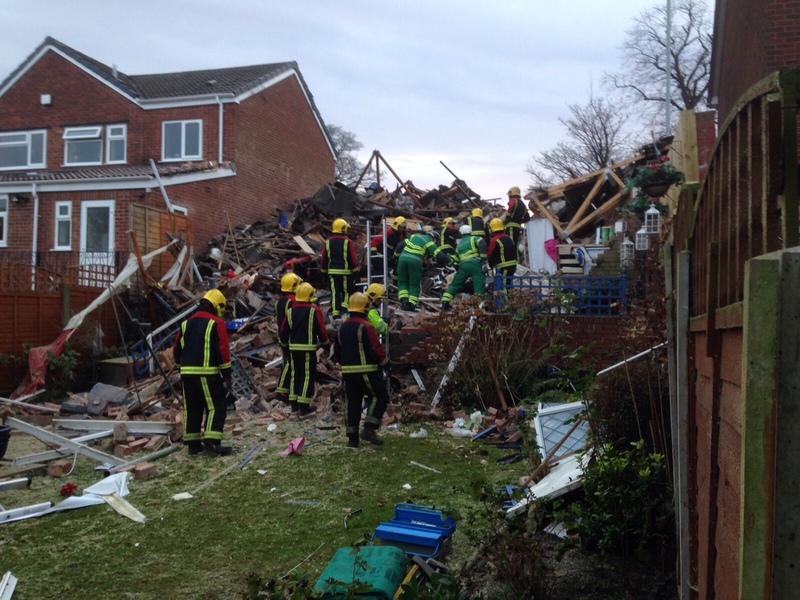 An elderly woman was trapped for over 90 minutes after an explosion at a house in Wolverhampton. 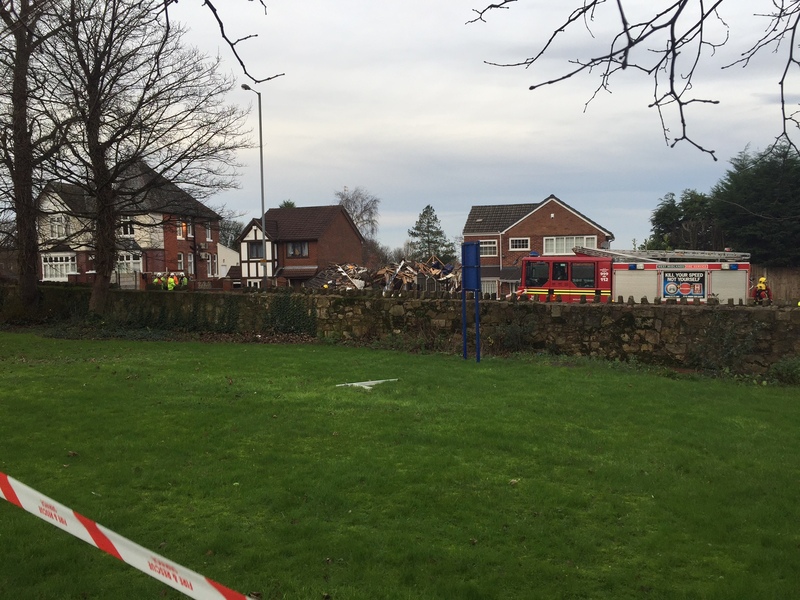 The house was reduced to rubble in the explosion, which happened at about 8.15am on Monday morning. An ambulance was on scene within three minutes of the call and was backed up by the Hazardous Area Response Team, two paramedic officers, the Midlands Air Ambulance from Cosford with the MERIT Trauma doctor on board and an emergency preparedness officer. 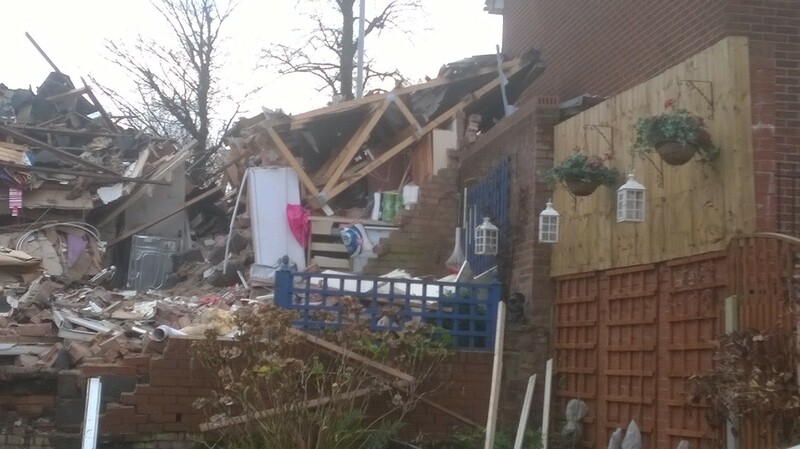 A West Midlands Ambulance Service spokesman, said: “Due to the level of damage, ambulance staff worked closely with firefighters to rescue an elderly woman who was trapped in the property. 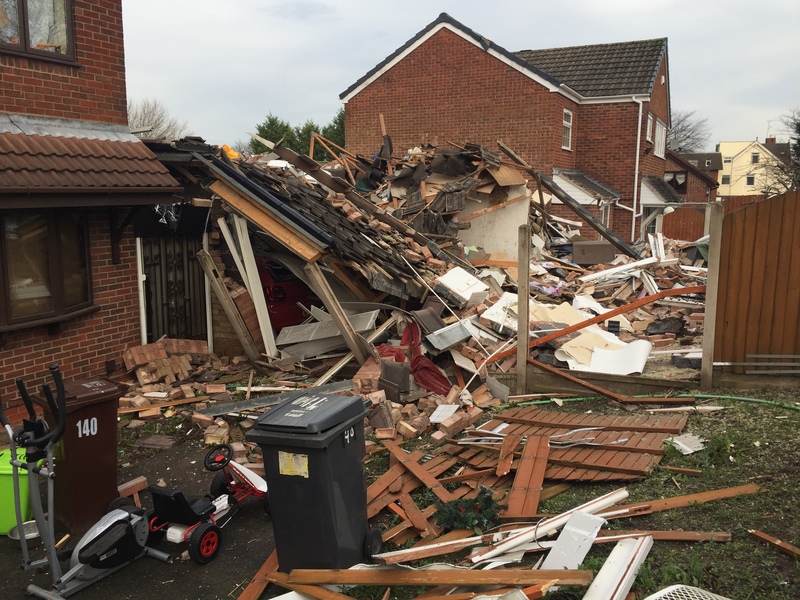 “Whilst the careful and methodical rescue was taking place, the paramedics from the Hazardous Area Response Team, were providing the woman with treatment in situ. “The 76 year old woman was carried down from the wreckage and assessed by the doctor from the air ambulance in the back of an ambulance. “She has suffered cuts and bruises and a broken ankle, but when you consider the level of damage to the property, she has been extraordinarily lucky not to have been more seriously injured. She was taken by land ambulance to New Cross Hospital. “A taxi driver who witnessed the explosion as he was driving by was also assessed by ambulance staff. Thankfully, apart from shock, he was uninjured and was released on scene. 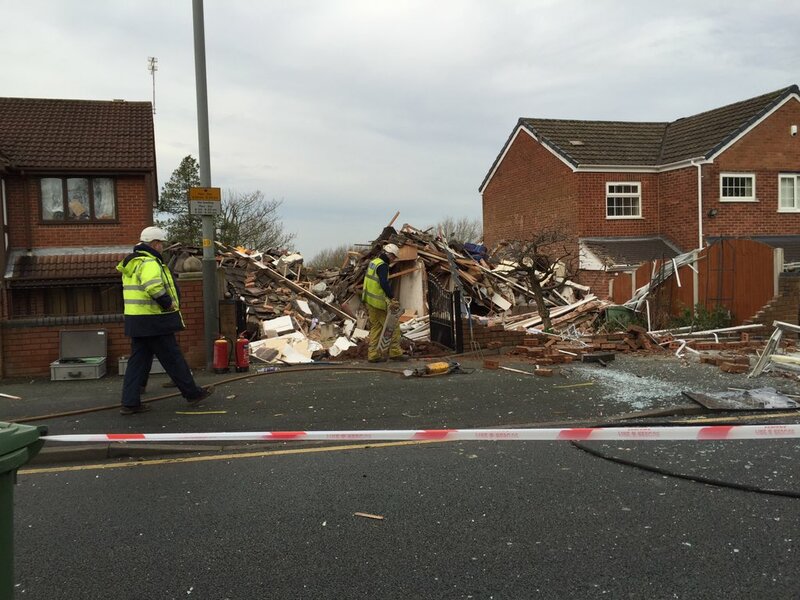 “Two neighbours were also assessed for shock at the scene but were also discharged. Sunday 27th December 2015 – 7pm – Jamie Arrowsmith. 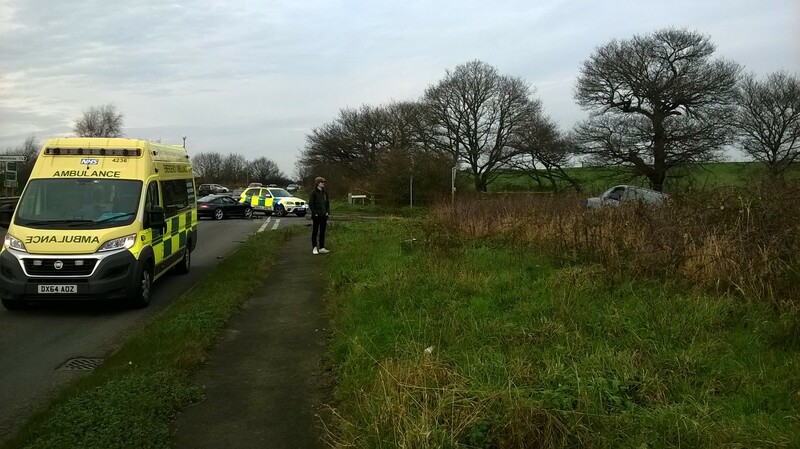 Four teenagers, one of whom was knocked unconscious, have been treated for a variety of injuries following a collision between a car and a tree this morning. West Midlands Ambulance Service was called to the junction of Station Road and the A4040 in Alum Rock, Birmingham, shortly before 8.15am and sent four ambulances, a paramedic in a rapid response vehicle and a paramedic area support officer to the scene. 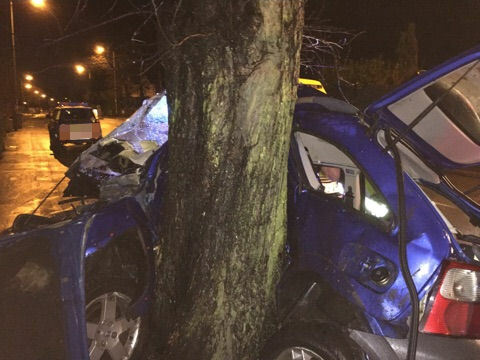 A West Midlands Ambulance Service spokesman said: “On arrival, crews discovered a car that had suffered significant damage following a collision with a tree. 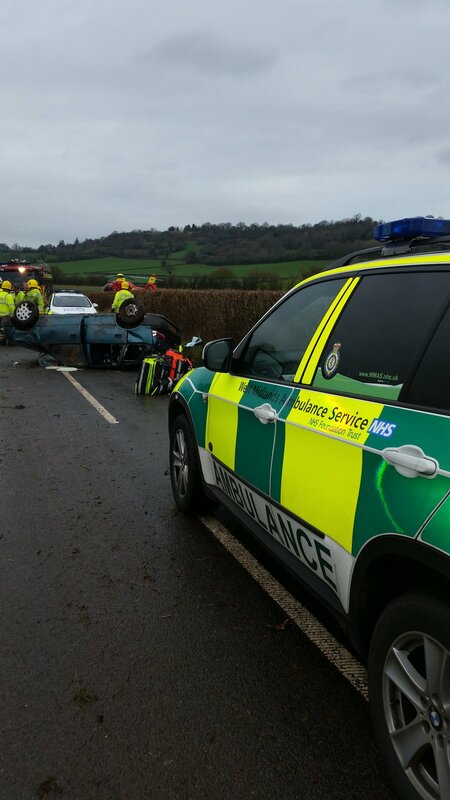 “There were four patients, two of whom had managed to free themselves from the vehicle whilst the two in the back of the car had to be assisted out. “From the back of the car, a 17-year old man was treated for a head injury having been knocked unconscious. He was immobilised and taken to Heartlands Hospital. “Also in the back was a 15-year-old boy who was treated by crews for a leg fracture and suspected pelvic injuries. He was immobilised and given pain relief before being taken to Birmingham Children’s Hospital. 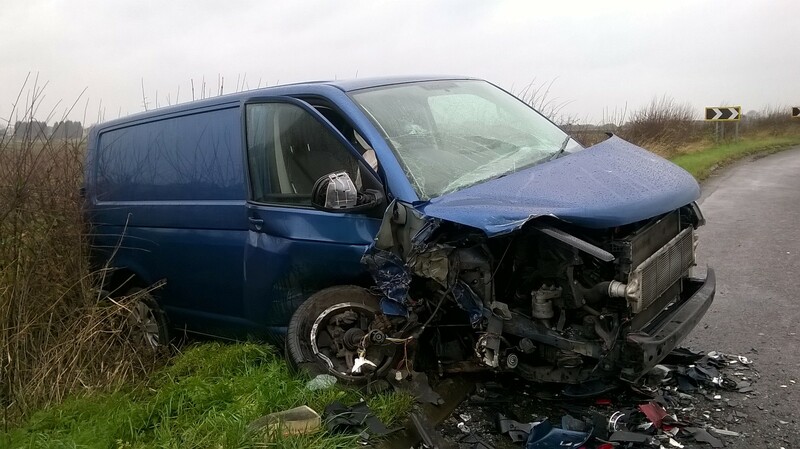 “The driver, a 17-year-old man, was taken to Heartlands Hospital after receiving treatment for neck and back injuries. Saturday 26th December 2015 – 11.15pm – Jamie Arrowsmith. A young cyclist has been treated for multiple injuries following a collision with a car this evening. West Midlands Ambulance Service was called to the junction of Tessall Lane and Hollymoor Way in Longbridge, Birmingham, shortly after 5pm and sent two ambulances and a community paramedic in a rapid response vehicle to the scene. A West Midlands Ambulance Service spokesman said: “On arrival, crews found a boy, believed to be 12-years-old, who had been involved in a collision with a car whilst cycling. “He was treated by medics for a suspected leg fracture and an ankle injury. 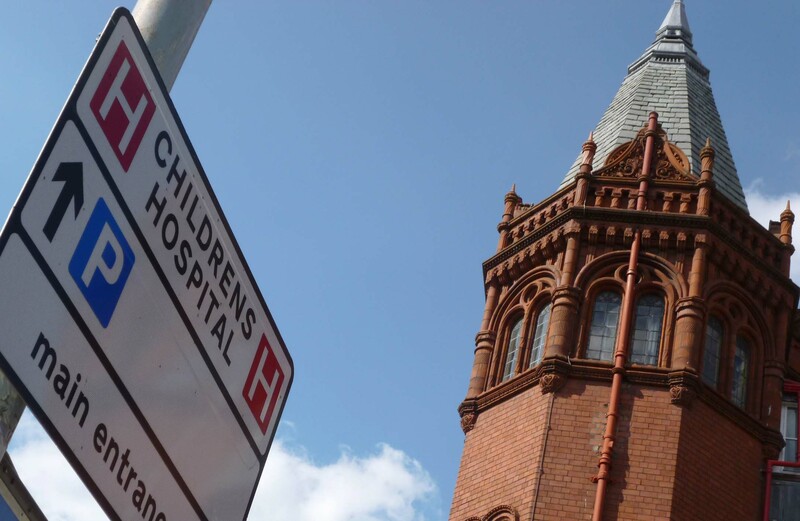 The boy, who remained conscious throughout, was immobilised and given pain relief before being transported to Birmingham Children’s Hospital for further assessment. “Nobody else was injured in the incident. Saturday 26th December 2015 – 9.30am – John Hawker. A woman has been treated by medics for the effects of serious smoke inhalation after being rescued from a fire last night. 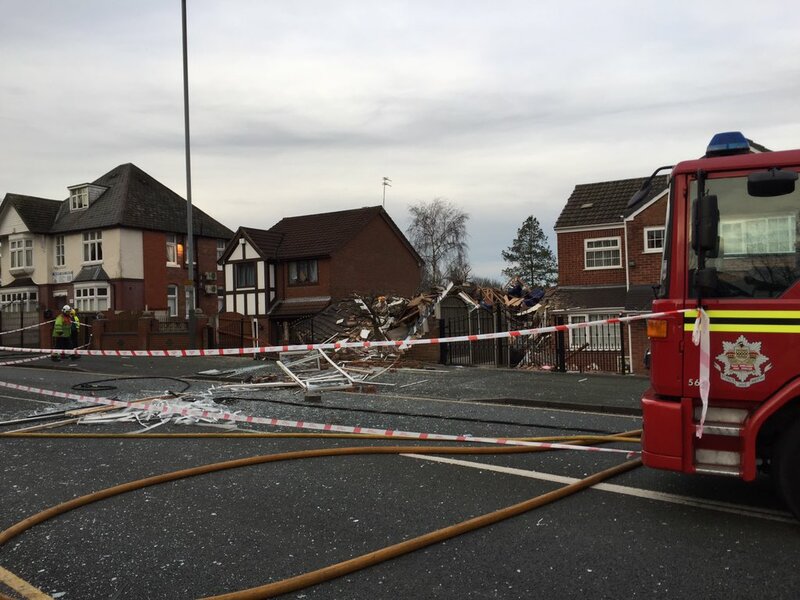 The fire occurred in a flat in Coltham Road, Willenhall at around 8.15pm. An ambulance and a paramedic officer attended the scene. A West Midlands Ambulance Service spokesman said: “Crews arrived to find a woman that had been rescued from the burning flat by the fire service. “The woman, believed to be in her early 40’s, received emergency treatment from medics for the serious effects of smoke inhalation. 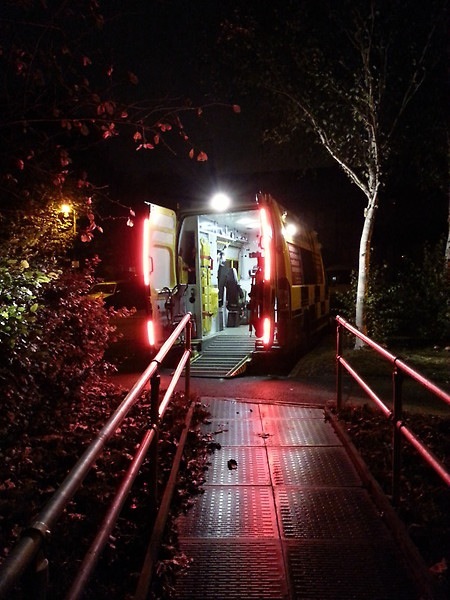 “Following treatment and the patient’s condition being stabilised, she was transferred by ambulance to New Cross Hospital for further emergency treatment. We hope you have all enjoyed our staff advent calendar over the last 24 days. Our staff are always helpful and professional, however sometimes when in front of the camera things don’t always go to plan! Thanks to them for their help and for also being good sports with today’s videos. Have fun everyone and Merry Christmas! Thursday 24th December 2015 – 1pm – Chris Kowalik. 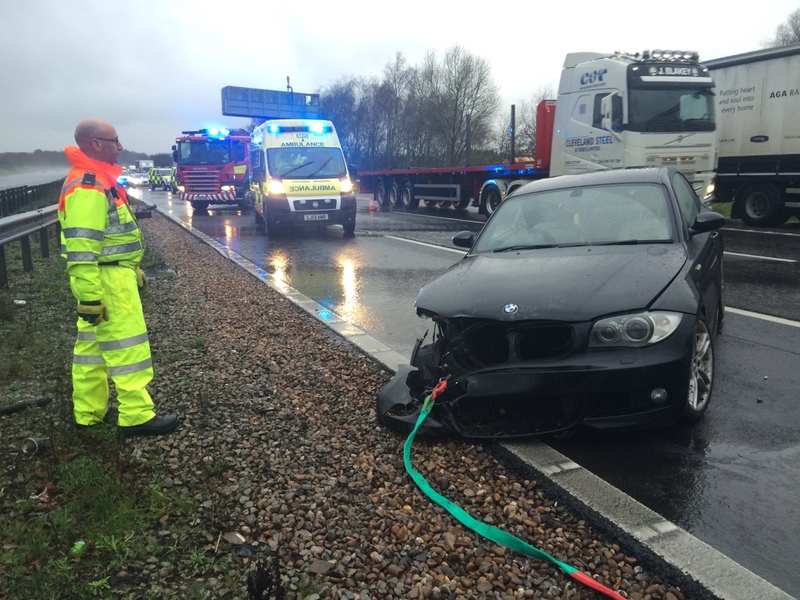 The driver of this car got out with only cuts and bruises after a crash between junctions 1 and 2 on the northbound carriageway of the M42 in Worcestershire. West Midlands Ambulance Service was called shortly before 9.30am today. The man was checked over and discharged at the scene. Thursday 24th December 2015 – 11.35am – Chris Kowalik. Five people have been injured in a collision involving a bus and two cars in Staffordshire. West Midlands Ambulance Service was called to Cannock Road, Penkridge shortly before 9am today. Four ambulance crews, a paramedic area support officer in a rapid response vehicle and the Midlands Air Ambulance from Cosford attended. A paramedic officer who was on her way to work and was in the area at the time was also assigned to the case. A West Midlands Ambulance Service spokesman said: “One of the car drivers, a man in his fifties, had a head injury. Following assessment and treatment at the scene, he was taken by land ambulance to Royal Stoke University Hospital. “The other car driver had chest and leg pains. 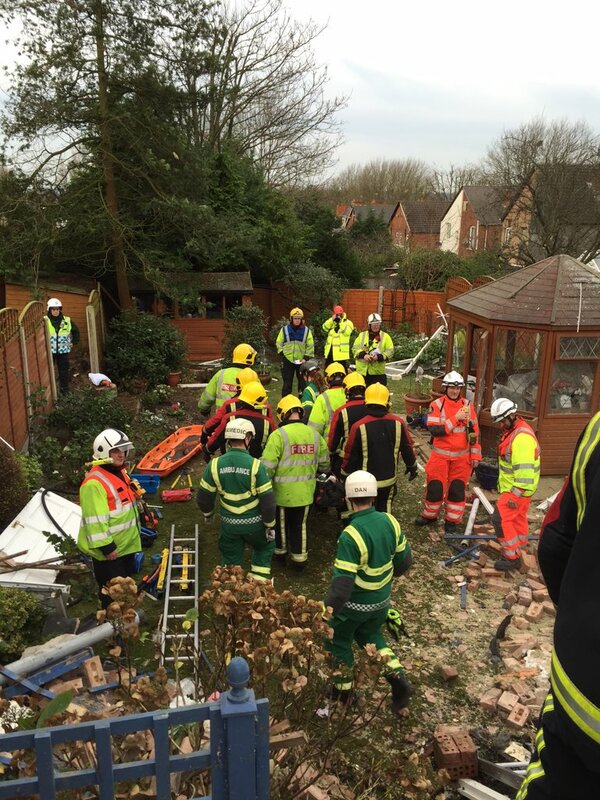 He was immobilised as a precaution and was taken to the County Hospital in Stafford. “The driver of the bus also had chest and leg pains. He was taken to New Cross Hospital. Thursday 24th December 2015 – 9.45am – Claire Brown. A man received vital trauma care at the roadside before being rushed to hospital after being involved in a serious road traffic collision in the early hours. West Midlands Ambulance Service was called to the A4041 Newton Road near to the crematorium, West Bromwich, at around 3.00am this morning (Thursday). Two ambulances attended the scene, one of which had come across the incident. They were joined by a paramedic area support officer, a MERIT trauma doctor and an advanced paramedic. A West Midlands Ambulance Service spokeswoman said: “Upon arrival crews found two cars which had been involved in a serious collision. 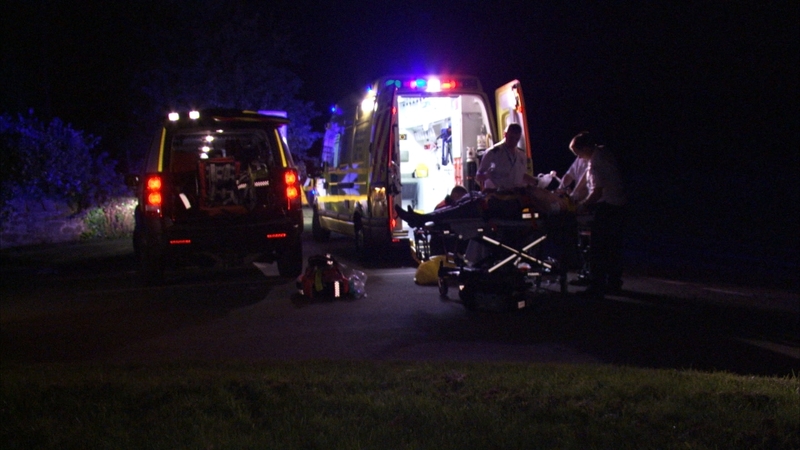 “The driver of one car, a man in his 20s, was unconscious and had suffered serious injuries. The medic worked closely with the team of ambulance staff on scene to stabilise his condition before he was transferred by ambulance on blue lights to Queen Elizabeth Hospital Birmingham for further trauma care. Thursday 24th December 2015 – 9.00am – Claire Brown. 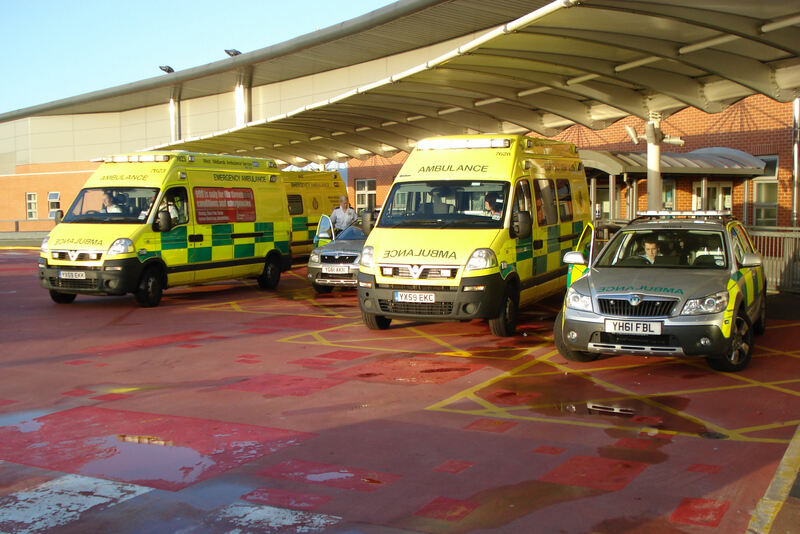 A collision involving three cars in the early hours left three men requiring a trip to A&E. The incident happened on the Wolverhampton Road in Oldbury near to Causeway Green Road shortly before 1.00am (Thursday). Three ambulances, a paramedic area support officer and a community paramedic attended. A West Midlands Ambulance Service spokeswoman said: “All three cars had sustained damage but it was the occupants of one car that needed treatment by ambulance staff. “The driver and two passengers from this car had to be extricated from the wreck with help from the fire service. A third passenger had already got out of the car upon our arrival. “One passenger, a man in his 40s, received the brunt of the injuries having suffered a nasty cut to his head and a broken arm. He was given pain relief and his head wound was dressed before he was immobilised with a neck collar and spinal board and taken to Queen Elizabeth Hospital Birmingham. “Upon assessment ambulance staff found that the driver, a man, had neck and back pain and he too was immobilised before being taken to Sandwell Hospital along with the other passenger, a man, who had minor injuries. Thursday 24th December 2015 – 7.40am – Claire Brown. A road traffic collision just before midnight last night sadly claimed the lives of two men. 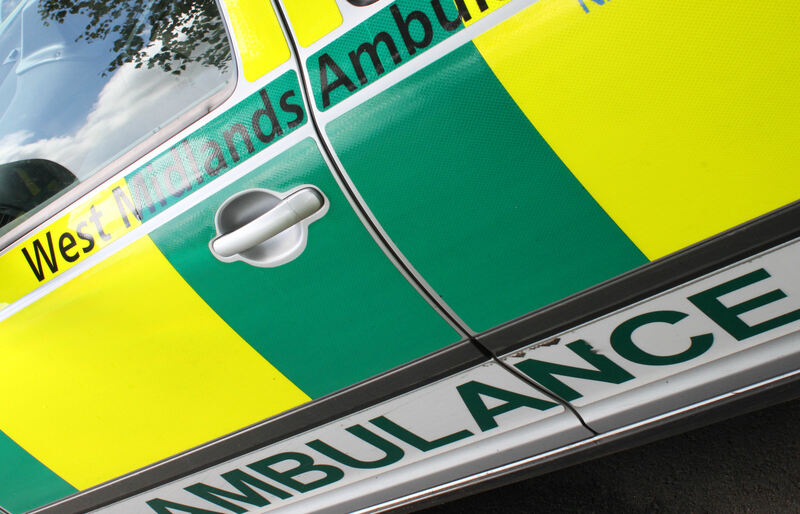 West Midlands Ambulance Service was called to Brettell Lane in Brierley Hill at 11.59pm (Wednesday) to reports of a collision between a car and a wall. Two ambulances, a community paramedic, a MERIT trauma doctor and advanced paramedic attended. A West Midlands Ambulance Service spokeswoman said: “Sadly, upon arrival, it quickly became apparent to ambulance staff that nothing could be done to save one man in the car and he was confirmed dead. Wednesday 23rdrd December 2015 – 2.20pm – Jamie Arrowsmith. 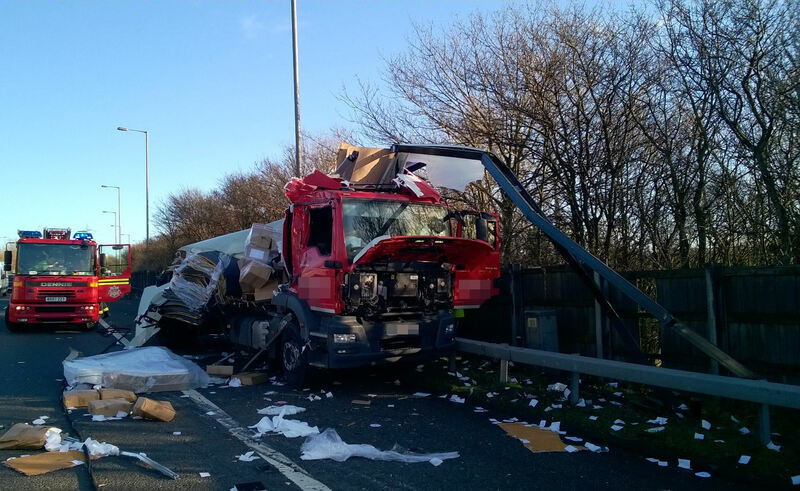 A lorry driver’s decision to get out of his broken down vehicle and move to safety has quite possibly saved his life following a collision on the region’s motorways this morning. A car transporter collided with the stationary lorry on the northbound carriageway of the M6, on the link road to the southbound M5 just after 10.30am. The collision caused extensive damage to the lorry whilst the car transporter left the road, smashed through a motorway barrier and travelled approximately 40ft down an embankment, finally coming to rest in a wooded area. 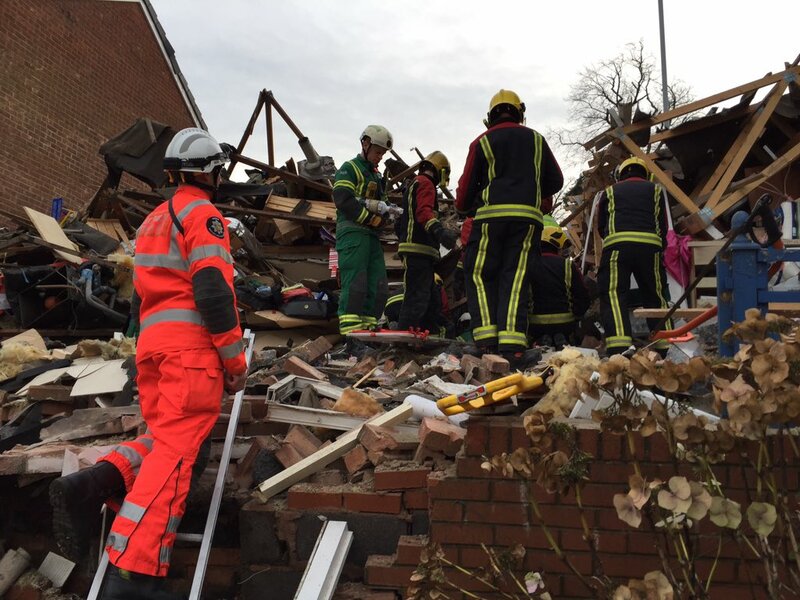 A West Midlands Ambulance Service spokesman said: “Both men are extremely lucky to be alive. 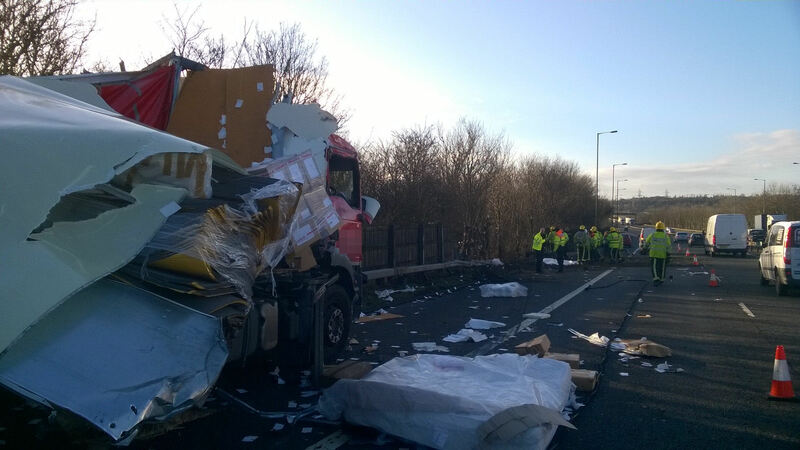 “The stationary lorry has suffered significant damage in the collision, having the side and roof completely ripped off. The driver’s decision to move away from his vehicle has undoubtedly saved him from significant injuries, if not saved his life. “A man in his 40s and a man in his 50s, the latter of whom was driving the car transporter, amazingly both escaped with very minor injuries in the incident which had the potential to be so much worse. Wednesday 23rd December 2015 – 11.35am – Jamie Arrowsmith. A man who was trapped in his truck for an hour before being cut free through the roof has incredibly escaped serious injuries this morning. 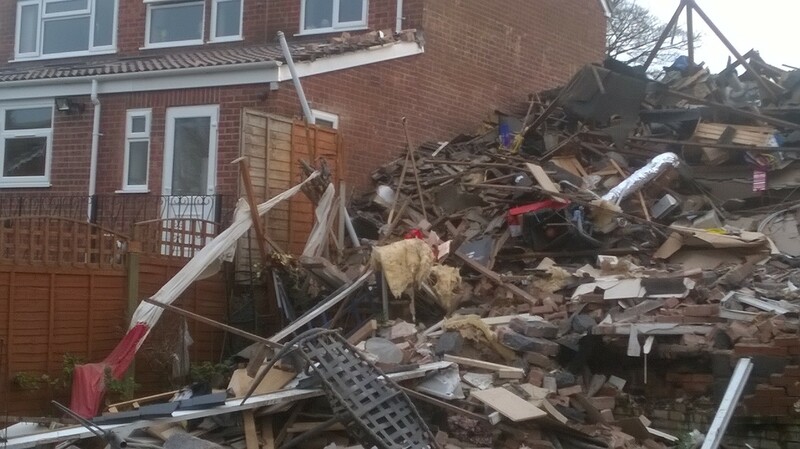 After leaving the road, the car came to rest at height, impaled on a fence, in a scaffolding yard in Shaw Road, Dudley, just before 8.40am. 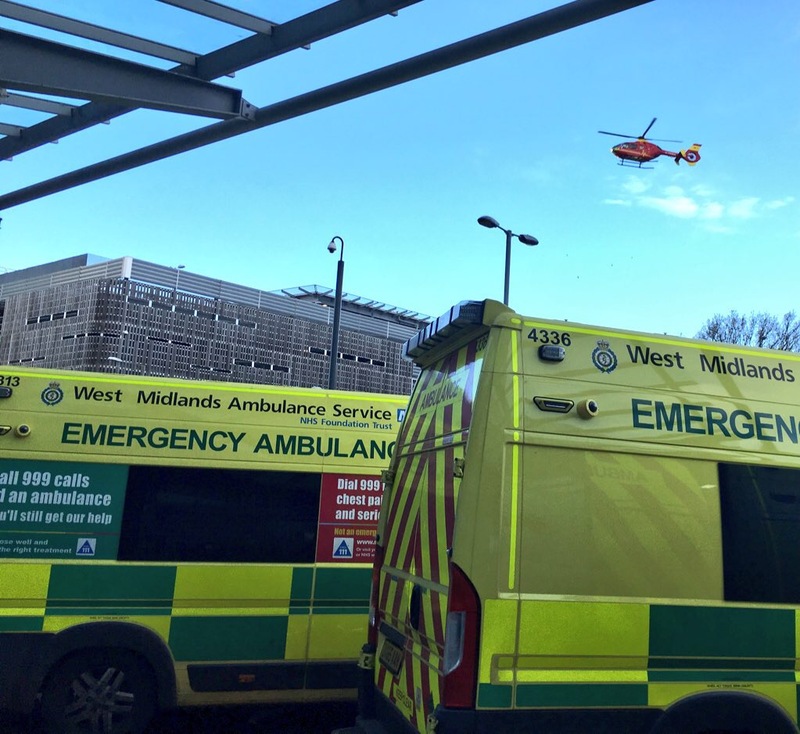 West Midlands Ambulance Service sent two ambulances, a paramedic area support officer, the West Midlands CARE team and the Midlands Air Ambulance from Cosford to the scene. A West Midlands Ambulance Service spokesman said: “On arrival, crews discovered a male patient, believed to be in his 50s, lying across the front two seats of his vehicle. “Due to the damage caused in the incident he was trapped and the fire service worked quickly to stabilise the car in order for ambulance staff to be able to fully assess the man. “Remarkably the man, who remained conscious throughout, had escaped serious injuries but was treated for minor injuries to his face, neck pain and a suspected fractured collarbone. Tuesday 22nd December 2015 – 4.30pm – John Hawker. A motorcyclist has been injured after being in collision with a bus in the Black Country this morning. 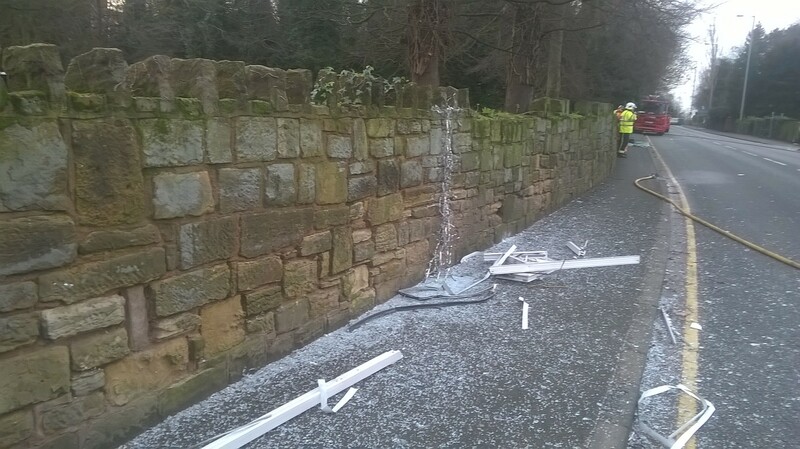 The crash occurred at the junction of Tunnel Street and Ivyhouse Lane, Coseley at around 10.00am. An ambulance, a paramedic officer and the CARE team attended the scene. A West Midlands Ambulance Service spokesman said: “Crews arrived to find a motorcycle and single decker bus that had been in a significant collision. “The man riding the motorcycle, believed to be in his 50’s, received emergency treatment for chest and suspected pelvic injuries. “The man’s condition was stabilised and he was transferred by ambulance to Queen Elizabeth Hospital for further treatment. The hospital was pre alerted to the man’s arrival and injuries. “Thankfully the man was wearing a motorcycle helmet and full leathers when the crash occurred. Sunday 20th December 2015 – 10.26pm – Murray MacGregor. 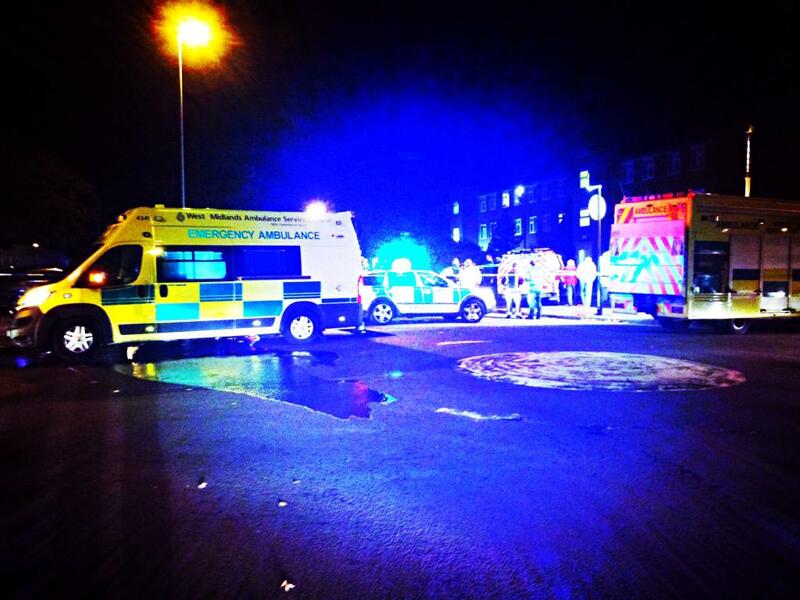 A teenager has suffered critical injuries after a collision with a car. The incident happened close to West Midlands Safari Park at Seven Hills near Bewdley at just before 6.00pm on Sunday evening. A rapid response vehicle was on scene in five minutes and was backed up by two ambulances and a senior paramedic officer. A West Midlands Ambulance Service spokesman said: “On arrival crews found a 16 year old boy who had suffered very serious injuries. “After treatment at the scene, he was initially taken to Worcestershire Royal Hospital. A doctor from the Midlands Air Ambulance rendezvoused with the crew en-route. “After further treatment at hospital, he was transferred to the major trauma centre at the Queen Elizabeth Hospital Birmingham with the MERIT trauma doctor travelling with the crew. “On arrival, his condition was ‘critical’. How did he escape with only minor injuries? Sunday 20th December 2015 – 8.25pm – Murray MacGregor. The driver of a car that was in collision with two parked cars and ended up on its roof has somehow escaped with relatively minor injuries. 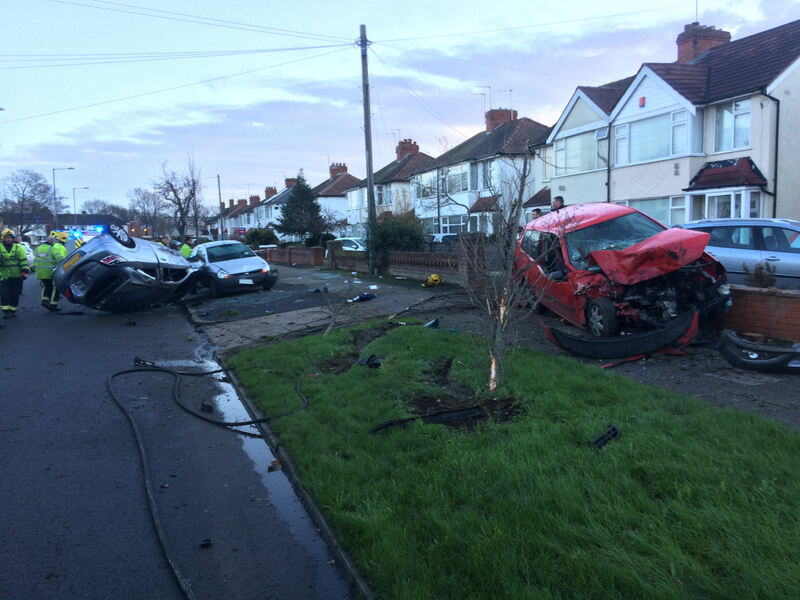 The crash happened on The Radleys in the Kitts Green area of Birmingham at about 7.55am on Sunday morning. The Trust received four 999 calls about the incident. An ambulance was on scene within seven minutes and was backed up by a paramedic area support officer. A West Midlands Ambulance Service spokesman said: “When crews arrived they found a number of people including a nurse looking after the driver of the silver Vauxhall. “Despite this, the driver was relatively uninjured. He was somewhat disorientated and had a graze to the back of his head but otherwise appeared uninjured. “As a precaution he was immobilised using a neck collar and spinal board before being taken to Heartlands Hospital for further assessment. Sunday 20th December 2015 – 6.35pm – Murray MacGregor. A motorcyclist has been flown to a major trauma centre for specialist care after suffering a serious hand injury in a low speed fall. The unfortunate incident happened at about 10.50am on Sunday morning on the minor road that runs between the Bank Farm Holiday Park and the Old New Inn at Arley on the Shropshire / Worcestershire Border. An ambulance was initially sent but the crew requested an air ambulance and the Midlands Air Ambulance from Strensham was sent to the scene. A West Midlands Ambulance Service spokesman said: “The rider, who was in his late 40s, told the crew that he had been moving at very slow speed when he toppled off the bike and got his hand caught in the chain. “Unfortunately, this caused a very serious hand injury that would require surgery, so the crew requested a helicopter for transport, as time was of the essence. Sunday 20th December 2015 – 8.05am – Murray MacGregor. Three people have escaped serious injury despite a huge amount of damage to two vehicles involved in a head on collision. The crash on the B4029 at Coombe Fields near Coventry happened at lunchtime on Saturday (12.35pm) involving a red car and a blue van. Two ambulances, a rapid response vehicle and a paramedic area support officer were quickly on scene. A West Midlands Ambulance Service spokesman said: “When crews arrived, they found one vehicle on either side of the road, both with extensive front end damage. “Despite this, the levels of injury were not as serious as you might have expected. 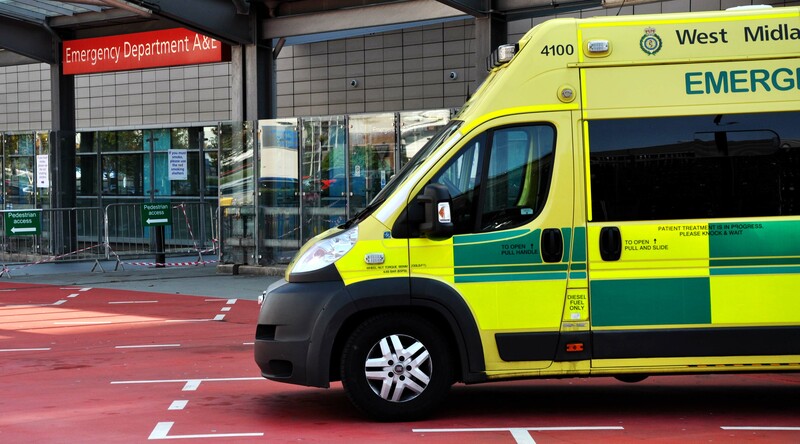 “There were a man and woman in their 50s in the van – the man was discharged on scene after treatment for minor injuries, but the woman was taken to University Hospital Coventry and Warwickshire with a hand injury. “The 19 year old man driving the car escaped with only facial and knee injuries. He was taken to the same hospital by ambulance. Sunday 20th December 2015 – 7.02am – Murray MacGregor. Another night of Christmas festivities; another night of frenetic activity for ambulance crew, but again West Midlands Ambulance Service staff coped magnificently with the onslaught. Regionally, call numbers (for the period 8.00pm Saturday – 4.00am Sunday) were up 10% compared to the previous Saturday night, but in Herefordshire and Worcestershire, the figures were just shy of 30% up on the previous week, with double digit rises in Staffordshire (+10.4%) and Black Country (+12.5%). However, compared to 2014, call numbers regionally were down slightly. Gold Commander for the evening, Nathan Hudson, said: “It was another hugely busy evening for our crews, but again, they were brilliant and provided a really high quality of service with rapid responses to cases. 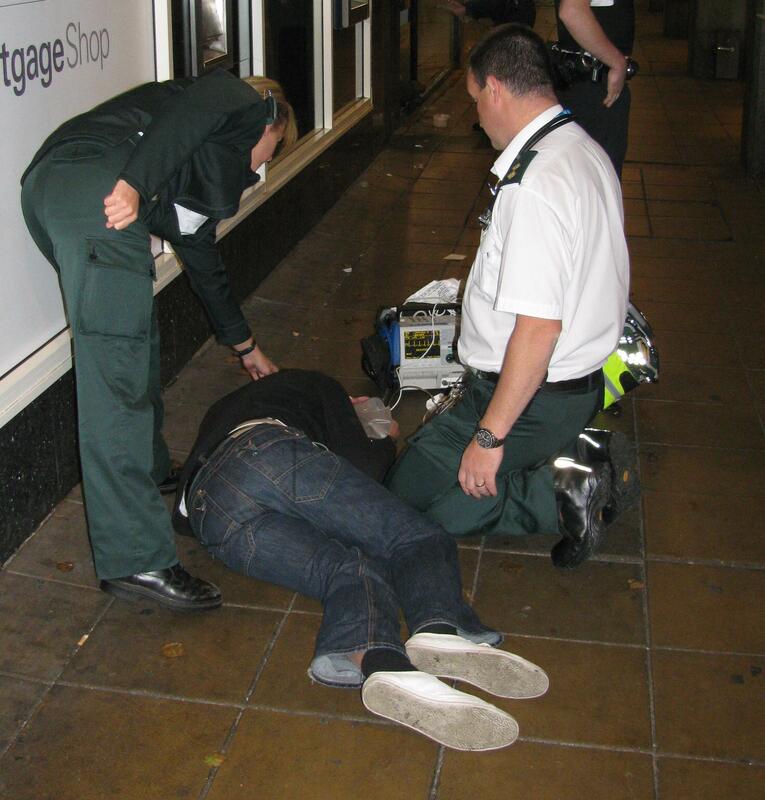 “As you would expect we saw a wide range of alcohol related incidents, ranging from people who had fallen over as they couldn’t stand up they were so drunk, to assaults, unconscious patients, and also drug related incidents from people who had taken so called ‘legal highs’. Saturday 19th December 2015 – 6.55pm – Murray MacGregor. 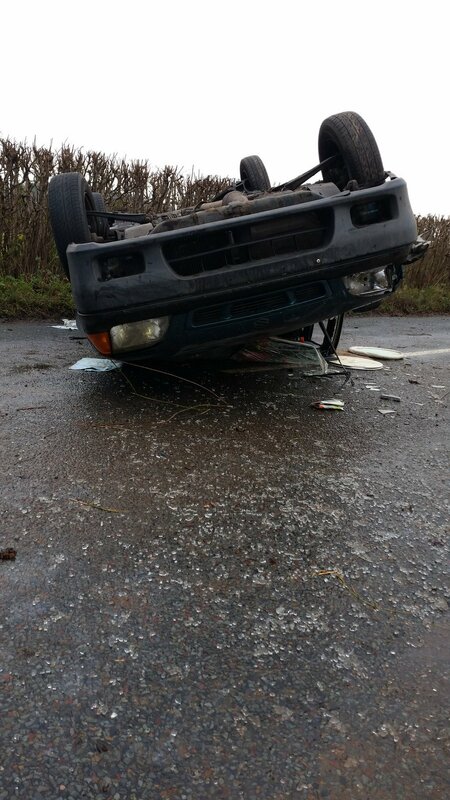 A man whose car collided side on with a tree before flipping onto it’s roof has escaped with remarkably minor injuries. When ambulance crews arrived they feared the worst. The crash happened on the B4113 near the National Agricultural Centre at Stoneleigh in Warwickshire at a little before 3.00pm on Saturday afternoon. A West Midlands Ambulance Service spokesman said: “When crews arrived they found a car on its roof with the driver trapped upside down, being held in by his seatbelt. “The car had suffered significant damage and required the fire service to remove the door to allow ambulance staff to get inside to start treating the driver, who was in his 30s. 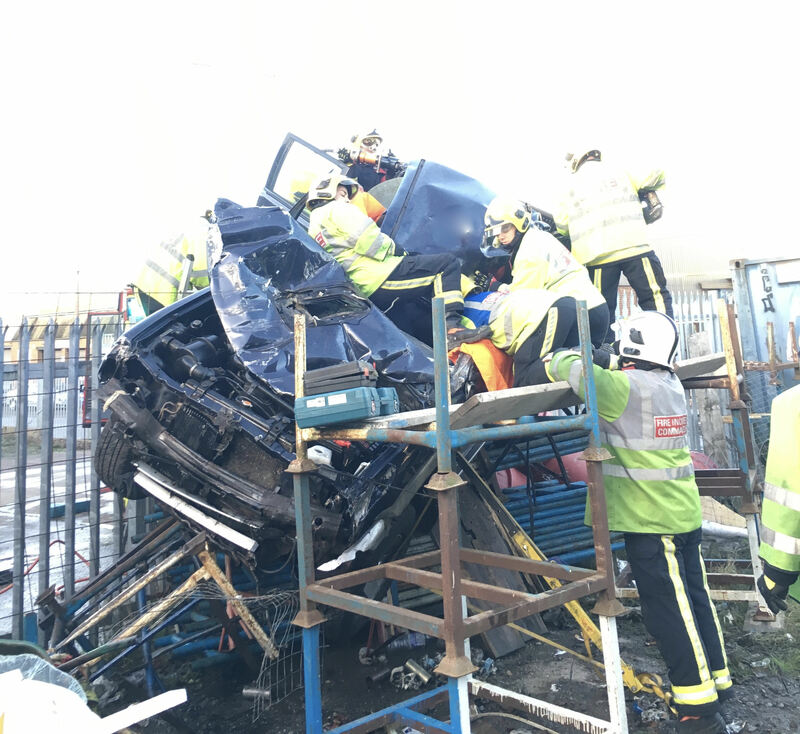 “After being extricated onto a spinal board and having a neck collar fitted, he was treated for a broken collar bone and right leg break. “He was taken on blue lights to the major trauma centre at University Hospital Coventry & Warwickshire by land ambulance. Saturday 19th December 2015 – 8.15am – Murray MacGregor. 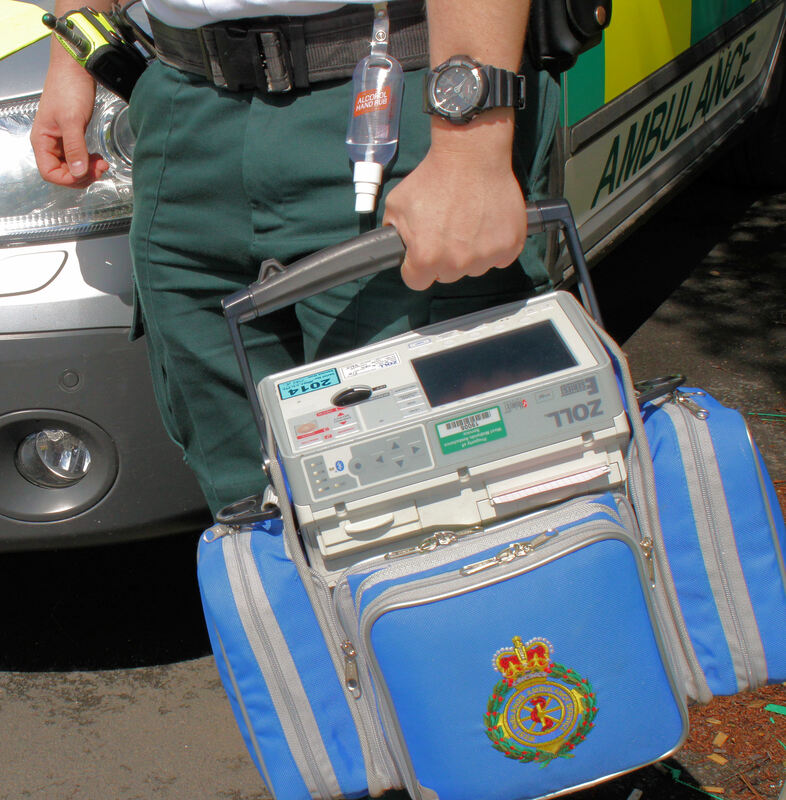 A pedestrian who was in collision with a car has been anaesthetised at the scene of the incident. The crash happened in Yates Avenue in Newbold on Avon near Rugby at about 11.25pm on Friday evening. A rapid response vehicle was on scene within minutes of the 999 call and was backed up by an ambulance, a paramedic area support officer and a doctor from the Warwickshire and Northamptonshire Air Ambulance in a response car. A West Midlands Ambulance Service spokesman said: “On arrival crews found a man in his 40s who was unconscious. The collision had damaged the windscreen and side of the car. 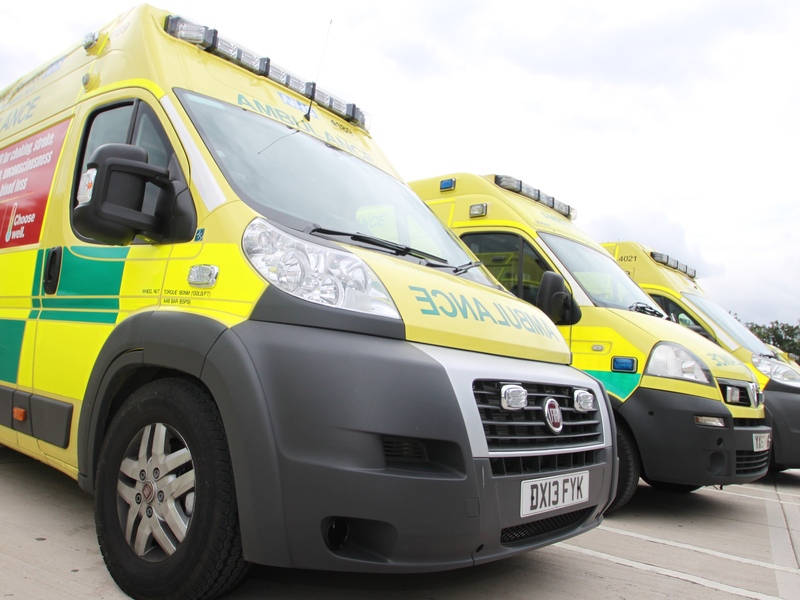 “Although the man started to come round, due to the head and chest injuries he had sustained, the doctor anaesthetised him at the scene before he was taken on blue lights to the major trauma centre at University Hospital, Coventry & Warwickshire. “Thankfully, the prognosis appears good. “The driver of the car was uninjured. Saturday 19th December 2015 – 7.10am – Murray MacGregor. 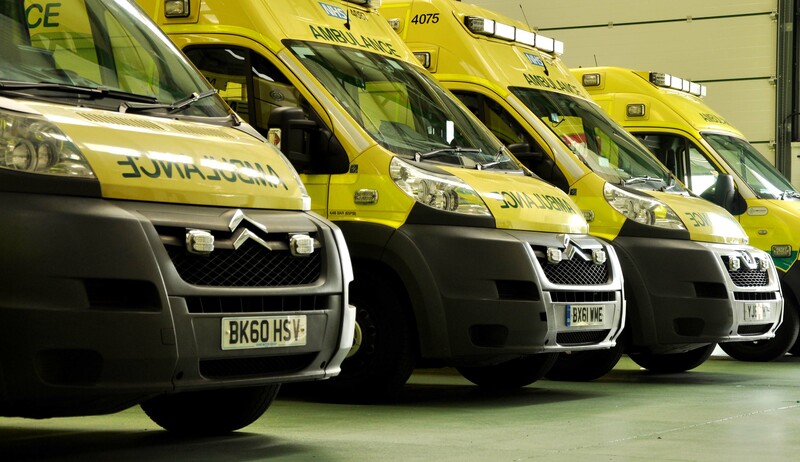 New figures show that despite it being very busy, good planning by West Midlands Ambulance Service ensured that patients received high levels of care. Overall, the number of 999 calls on so called ‘Black Friday’ rose by only a handful compared to 2014, but the situation was quite different depending on the area you were in. There were rises in call numbers in Birmingham, the Black Country and Shropshire, but falls in Coventry & Warwickshire, Staffordshire and Herefordshire & Worcestershire. The Trust ensured there were considerably more resources on duty across the Region than a normal Friday night to cope with the predicted demand. It also worked with partner agencies such as Birmingham City Council, Central Accident Resuscitation Emergency (CARE) Team nurses and doctors, Community First Responders and volunteers from the British Red Cross, St John Ambulance and West Midlands Police to provide a Temporary Minor Injuries Unit and City Centre Treatment Unit in Birmingham City Centre. Gold Commander for the evening, Nathan Hudson, said: “First of all, I’d like to thank our staff for their fantastic response to a very challenging evening. They worked really hard in often difficult circumstances dealing with patients who were often very much the worse for alcohol. “We put a lot of planning into the evening and everything worked very well, which ensured we were able to provide a high level of service to patients, right across the region. “I’d also like to thank the public, who in the main, followed our advice and looked after their friends who they were out with. Friday 18th December 2015 – 6.33pm – Murray MacGregor. Despite his motorbike and a car door being badly damaged, a motorcyclist has seemingly escaped serious injury. After a number of 999 calls at 4.45pm on Friday afternoon, two ambulances, a rapid response vehicle, a paramedic area support officer and a BASICS emergency doctor were sent to the scene. A West Midlands Ambulance Service spokesman said: “Initial reports suggested that the rider was in a bad way. “When crews arrived they found that both the driver’s door and the bike had suffered considerable damage. “Thankfully, a top to toe assessment of the rider, who was in his 20s, could find no obvious injuries, though he was quite shaken. “As a precaution, he was immobilised using a neck collar and spinal board before being taken to Royal Stoke University Hospital for further assessment. Friday 18th December 2015 – 3.30pm – Claire Brown. 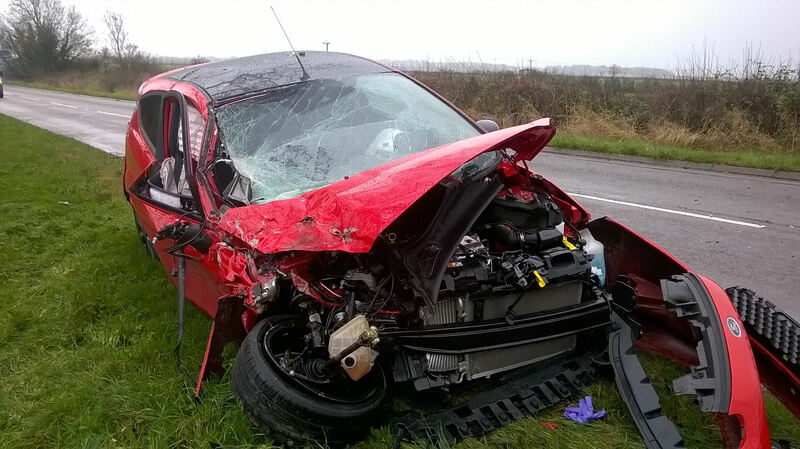 A collision involving two cars in Nuneaton left one car in a field and two patients thankful to escape serious injury. West Midlands Ambulance Service was called to the B4102 in Astley shortly after 12.30pm this afternoon (Friday). An ambulance, a paramedic area support officer and a community paramedic attended the scene. A West Midlands Ambulance Service spokeswoman said: “When the emergency services arrived they found one damaged car on the road and another some distance away in a field. 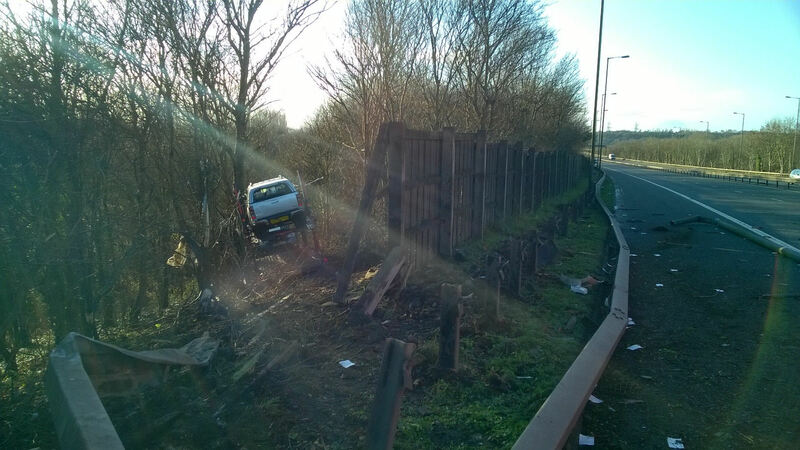 “Upon assessment by ambulance staff, the two drivers had thankfully escaped serious injury. 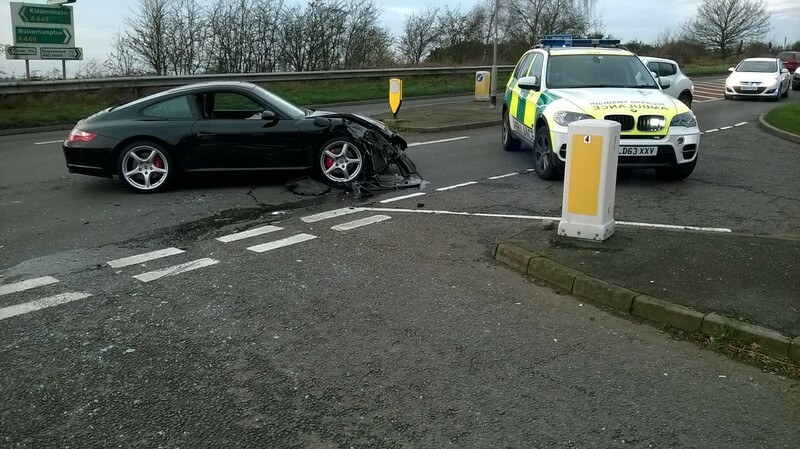 A woman in her 20s from one car was, however, given treatment on scene for a minor chest injury. Ambulance staff administered pain relief to her before she was taken to George Eliot Hospital for further checks. Friday 18th December 2015 – 7.35am – Murray MacGregor. A middle aged woman has suffered a serious head injury after colliding with a moped outside a pub. The unfortunate incident happened outside the Plough Inn, in King Street, in the Wellington area of Telford at just after 9.00pm on Thursday evening. Two ambulances, a paramedic officer, a BASICS doctor and the MERIT trauma doctor were sent to the scene. A West Midlands Ambulance Service spokesman said: “The collision took place right outside the pub and resulted in the moped rider coming office his machine. “The woman in her 60s suffered a nasty head injury with a possible fracture to her skull. Due to the woman’s condition, the doctors decided that she should be taken to the major trauma centre at Royal Stoke University Hospital. The MERIT doctor travelled with her in the ambulance. Friday 18th December 2015 – 7.15am – Murray MacGregor. A teenage girl has suffered critical injuries after a collision with a car. The incident happened near to Pedmore Technology College & Community School in Grange Lane, Lye at just before 10.00pm on Thursday night. Initially, an ambulance, a rapid response vehicle and two ambulance officers were sent to the scene. A West Midlands Ambulance Service spokesman said: “On arrival, it was clear that the 15 year old had multiple serious injuries. There was no car at the location. “She was treated at the scene by ambulance staff before being taken to Russells Hall Hospital. “After being anaesthetised, the MERIT trauma doctor was called and he travelled with her in an ambulance to Birmingham Children’s Hospital for specialist care. Thursday 17th December 2015 – 6.57pm – Murray MacGregor. A motorcyclist has been sedated by an advanced paramedic after suffering potentially serious injuries after his bike collided with a van. The crash happened on the A38 at Lydiate Ash, just off junction 4 of the M5 motorway. An ambulance, a rapid response vehicle, a paramedic area support officer and the aircrew from the Midlands Air Ambulance at Strensham, who were in a response car, were sent to the scene after the crash at shortly before 5.30pm on Thursday evening. A West Midlands Ambulance Service spokesman said: “When crews arrived they found the crash scene at the junction of Lydiate Ash Road. There was a van that had damage to the driver’s side front wheel. The bike was close by. “People at the scene told ambulance staff that the rider had been thrown over the bonnet of the van and had landed some distance away. “Although the man riding the bike, who was estimated to be in his 20s, had taken his helmet off, ambulance staff assessed him as having a head injury. As a result, he was sedated by one of the critical care paramedics from the air ambulance. “He was immobilised using a neck collar and spinal board and had a pelvic binder applied. He was complaining of pelvic and lower limb pain. 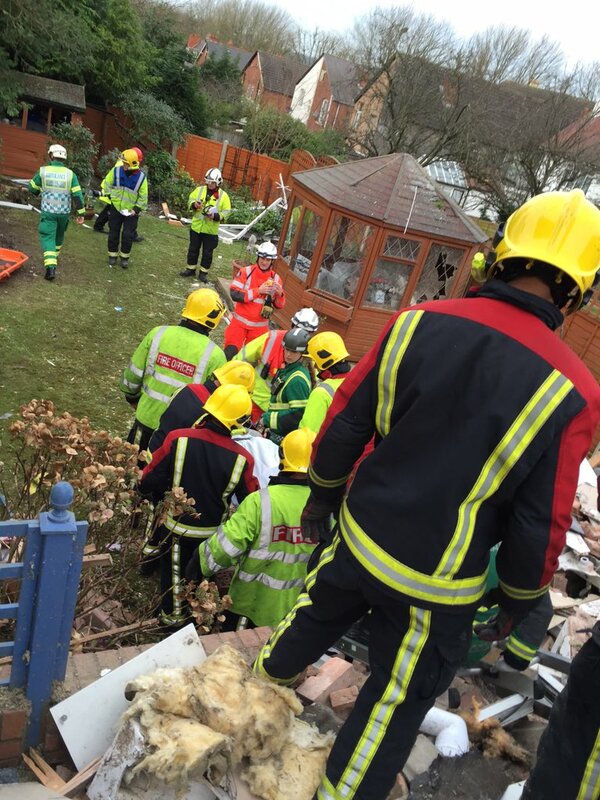 “After treatment at the scene, he was taken to the major trauma centre at the Queen Elizabeth Hospital Birmingham. Thursday 16th December 2015 – 12.05pm – John Hawker. A group of life saving volunteers have been given an early Christmas present thanks to the generosity of a Coventry based company. The Coventry Building Society made a huge £20,000 donation to the Coventry Community Responder group that has enabled them to buy a second car to attend 999 calls in. CCR is a Community First Responder scheme whose volunteers are trained by West Midlands Ambulance Service to a nationally recognised standard. They can be called upon to attend medical emergencies in their area while a blue-light vehicle is en-route. The keys to the fully equipped Skoda Yeti was handed over to the group Chairman, Mark Tolan, last week by the Mayor of Coventry, Michael Hammon, and Anna Cuskin, from Coventry Building Society. Thursday 17th December 2015 – 8.30am – Murray MacGregor. Two men have died after a collision between a van and an HGV on a busy motorway. The crash on the southbound M6 between Junction 2 at Coventry and Junction 1 at Rugby happened at just before 5.30am on Thursday morning. A West Midlands Ambulance Service spokesman said: “When crews arrived they found a van and a lorry that had been in a significant collision. “Sadly, it quickly became apparent that nothing could be done to save either man in the van and they were confirmed deceased on scene. Wednesday 16th December 2015 – 7.05pm – Murray MacGregor. 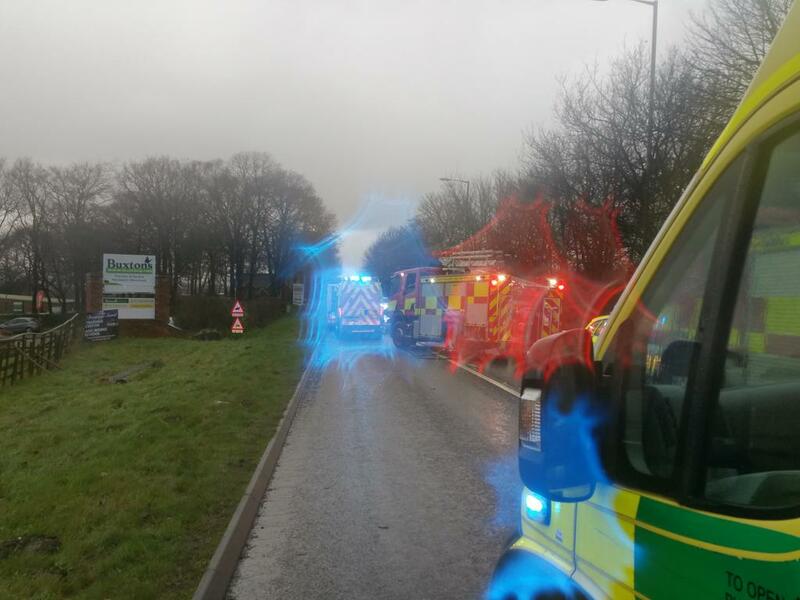 A man who was rapidly extricated from a car involved in a crash with a lorry has been taken to hospital on blue lights with a request for a trauma team to be on standby. The incident happened on the A4103 at Leigh Sinton in Worcestershire at just after 5.00pm on Wednesday afternoon. A rapid response vehicle was on scene within seven minutes and was quickly backed up by two ambulances and a paramedic area support officer. A West Midlands Ambulance Service spokesman said: “On arrival, crews found a car that had extensive damage to the rear and driver’s side. The driver, who was in his 40s was rapidly extricated through the passenger side after firefighters removed the door. He was treated at the scene by ambulance staff with drugs and was immobilised due to the circumstances. “He was then alerted into Worcestershire Royal Hospital with a request for a trauma team to be on standby; the paramedic on the response vehicle travelled with ambulance crew due to the patient’s condition. “Firefighters then removed the roof of the car to get a 16 year old boy out of the car. He was also taken to the same hospital as a precaution with minor injuries. “The lorry driver was uninjured.